Yesterday a friend asked me about art books I use for inspiration and guidance, so I thought I'd post the list of what I currently refer to in my work. The order they're listed in is the order in which they're sitting in the stack by my left elbow. I also try to absorb as much as possible from the Surface Design Journal and Fiberarts Magazine, and other artists' blogs. So happy reading! I had an idea last night for something I haven't seen anywhere, so I'll post photos later when I'm finished experimenting! The first two were made with a variety of gridded things and bubble wrap. 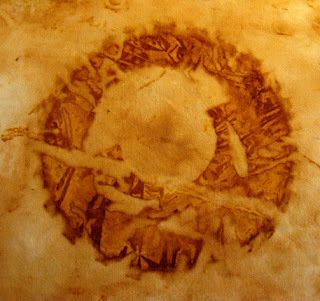 The third one was made with bamboo leaves, fern fronds and grains of rice. They are works of art in themselves. I'm really looking forward to using them -- maybe tomorrow! but probably not until next week. This weekend I'm phoning voters in swing states on behalf of the Obama/Biden campaign. I really want to see BIG change happen in this country and by extension, around the world. It's time! The latest little quilt I'm working on is a piece of black cotton/rayon that I'd discharged with small squares -- and today I discharged this black cotton for the backing. Discharged polka dots, how cool is that! 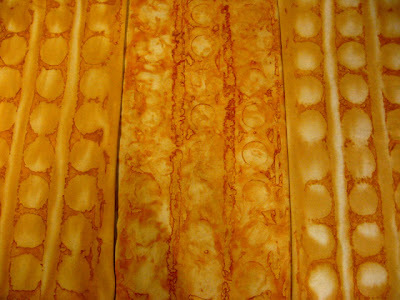 Most of the yard of fabric was discharged with Clorox Bleach Pen, and looks just like the section on the left in the photo...although in the flesh the dots are quite a bit more orange -- good Hallowe'en fabric! That first pen ran out, and I went to the Dollar Store to see if they had the same thing, but they had a different brand, which you see on the right, and which I thought I didn't like at first...so then I went elsewhere to get another Clorox pen to finish off the project. But in the end I think I prefer the quality of the patterns with the off-brand bleach pen, so now I'm looking forward to doing something else with it. Essentially, the bleach liquid in the second pen was thinner and clearer, but it leaves marks that look quite a bit like wax does on fabric. Anyhow, now I have backing for my quilt, which will be another whole cloth quilt, embellished with metallic paint and beads. I'm anxious to get working on that. I do love to quilt, making all this interesting fabric has awakened the quilter in me, and I just joined SAQA (Studio Art Quilt Associates). It's likely Rayna Gillman inspired me here, by using her fabulous printed fabrics in her fabulous quilts! I've been spinning a little bit these days, as well. Not nearly as much as I had been for the last 10 years, because my hands have been bothering me a lot! 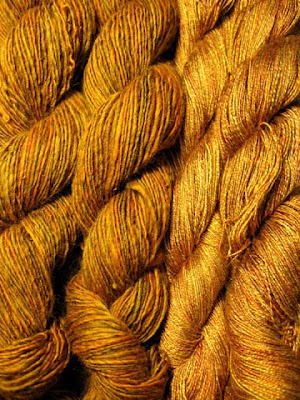 I've been spinning up the multi colored merino on the left, making singles that I will weave up with this hand dyed 2-ply silk that I spun a couple years ago. 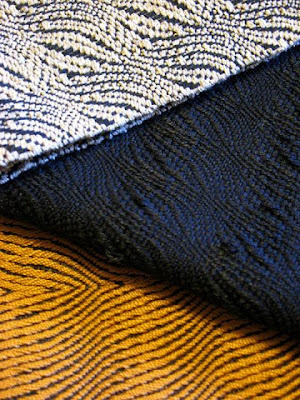 I'm thinking of doing a shadow weave piece, then using that as a substrate for surface design. I guess I've really taken to heart that old wives' adage, Idle hands are the devil's playground, because my hands are very rarely idle! 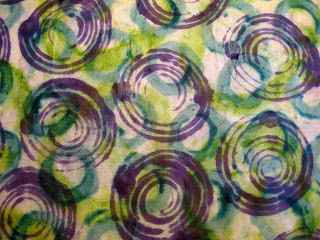 More fabric printing today, this time with stronger dye colors. I'm quite satisfied now that I can get the depth of shade I want on my fabrics. I printed half a dozen pieces today, the three above "work" for me. The top two are detail shots. The piece on top is about 18" x maybe 45," the second one is about 25" x 60," and the bottom one is about 25" x 25." I really like doing this all-over patterning. In all this sampling I've been doing lately, I've been getting a handle on what I like and what I don't like -- the processes I prefer, the tools I prefer to work with, the items that give me the visual textures I want. In an unlimited field of options, it's a good thing to focus on a few things. After I printed fabric, I prepared three silk screens to do deconstructed screen printing the next time I'm in the mood to print fabric. 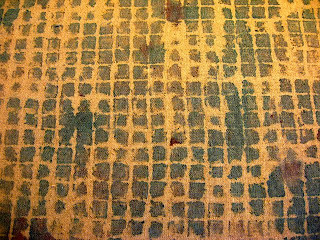 Deconstructed screen printing is a process where you "glue" textural items on the back of a silk screen (in this case, stuck onto the screen with thickened dye that has dried). 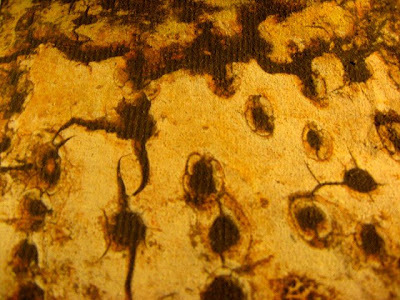 After the screen is dry and the objects are taken off, the surface of the screen retains the dried, textured dye that is then printed off with print paste or discharge paste or thinner or unthickened dye. 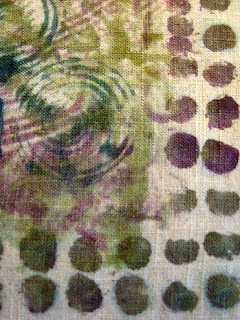 Each time the squeegee with the wet media passes over the screen, more of the dried dye is released, creating a slightly different print from the last one or the next one. I can't wait to print with these. But first I have to soda soak some more fabric. Tomorrow I'll be discharging a yard of black commercial cotton to use for the back of another small quilt I'm working on. 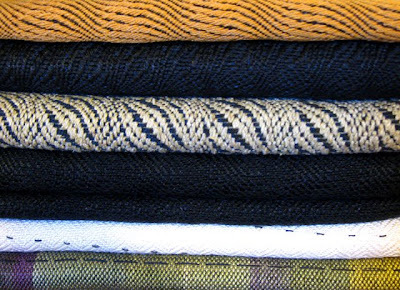 I also plan to work on my current set of woven fabrics -- I'm on the third piece of the batch. And I'm trying to get something to rust onto a piece of handwoven silk from that last batch of woven fabric. I don't think it's working, though, so I'll have to try another rusted object tomorrow. 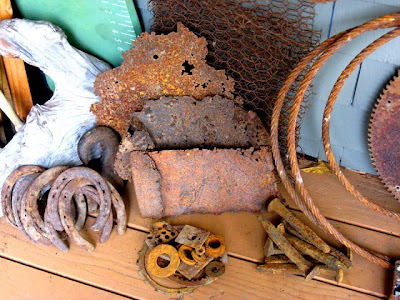 I worked on these three related rust pieces over the last five days or so, and laundered them today. There was actually a fourth panel but it didn't take well so I'll do something else with it. Anyhow, I'm kicking around a few ideas for these pieces. I'm not sure yet whether they'll end up quilted, because the reverse sides are about as interesting as the fronts. So perhaps free-hanging panels. But I can see some really interesting quilting happening, as well. Right now, though, there are numerous other projects hanging out in the not-yet-finished state so I'm hoping to actually wind a few things up in the near future. I mentioned yesterday that I had mixed stock solutions of the Procion MX dyes at the same concentration that I've always used for stock solutions of acid dyes. For acid dyes -- Lanaset in my case because I think Jacquard might require a different concentration of powder to water -- I've always mixed 5 grams of dye powder to 500 millileters of water to get a 1 percent stock solution (1 gm/100 ml = 1%). So that's what I did originally with the Procion dyes. It's also important for me to note, here, that I do not buy tons of dye colors -- I did that when I started dyeing, years ago, but never got the colors I really wanted. So since then I've always mixed my colors from primaries. 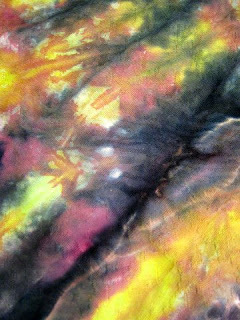 In the Sabraset/Lanaset acid dye line I use scarlet, magenta, turquoise, royal blue, violet, sun yellow and black. I'm also mixing colors with the fiber reactive dyes, so again I'm just using the primaries. That means that I've got to start with stock solutions -- because it is virtually impossible to accurately mix colors using dye powder. I want a lot more control over the colors than I'd get if I used impossible-to-measure nano-amounts of powder. So, I just measured in quarter teaspoons how much dye powder was in the 5 grams of powder that I had used for the original batch of Procion stock solutions. And the answer was about 6. So I had used 6 quarter tsp for 500 ml/2 cups of solution, or 3/4 tsp powder per cup of water. Which is a weak solution of color for fiber reactive dyes, as I've just learned. Yesterday a gal I met in a local fabric shop said she uses 1 tsp dye per cup of water, and this morning TieDyeJudy responded to my post of yesterday saying she uses 2 tsp dye per cup of water. I'm going to continue to make stock solutions for my work with fiber reactive dyes, and now that I've nearly finished up the tiny jars of Procion MX dyes, I'm switching to Sabracron/Cibacron F's. The primary colors in that line that I'll be using are true red, magenta, turquoise, azure blue, royal purple, sun yellow and rich black. And although there might be some difference in concentration between the two fiber reactive dyes, because of different chemical compositions, I'll be starting out with higher concentrations of powder to water in my stock solutions. Or maybe not! Perhaps I'll do an experiment first with small amounts of stock solutions, using my original one percent formula, to see whether Sabracrons are more concentrated, by nature, than Procions. So stay tuned! I fooled around today with Procion MX dyes and assorted cotton fabrics, working on different methods of applying dyes, dye intensity, and color-setting methods. There's still tons to learn, and tomorrow I'll be at it again. Mostly today I did low water immersion dyeing with straight mixed-color dye stocks (i.e., no thickener), some folding and dipping, and some scrunching. (It's Friday morning, now, and for those of you who are just reading this post, let me add that I pre-soda soaked the fabrics the day before and let them air dry. Then I dyed them Thursday.) I wasn't being too particular about the colors, just so I had a variety so I could see them work together. With the first group I dyed the samples, and then immediately wrapped them in plastic and steamed the bunch for 30 minutes. Then washed and dried them. The colors were less bright than I'd hoped. 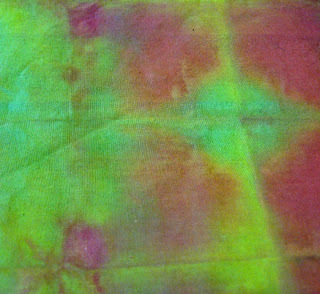 The next batch was dyed the same way, but I left the samples to air dry on a piece of plastic on my backporch. After they were dry, I wrapped in plastic and steamed, then washed and dried. The colors were just a bit more bright, but not that much in comparison to the first group. So I'm going to increase the amount of dye powder I use in the future. The only way for me to know what I would get with these dyes was to work with a baseline amount of dye and go from there. 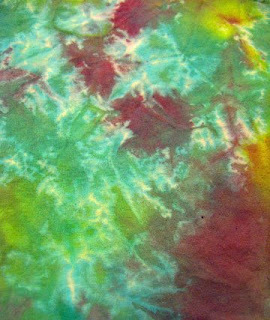 I used the same amount of dye powder to water with these fiber reactive stock solutions that I've always used with acid dyes, and that was my baseline. 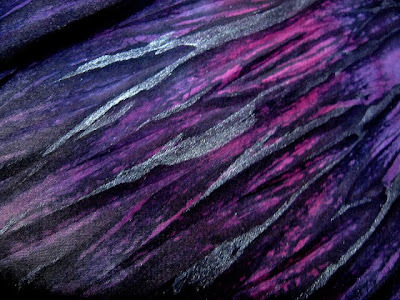 With a little bit of experience now, I think the quantity of fiber reactive dye powder needs to be increased because the dyes themselves seem to be less intense per weight than the acid dyes. I tend to be scientific about these things so I have some control over what I get. I always think that dyeing is probably what I learned math for in high school and college! Dyer's Math, I call it. Yesterday I over-shiboried this scarf from many years ago. 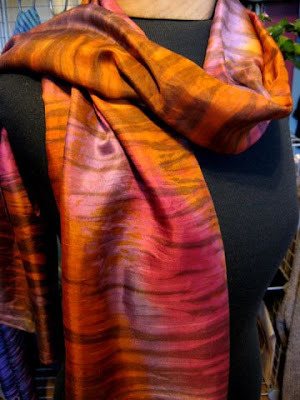 The scarf is a silk twill with a lovely drape. Now it's a lot more interesting! This morning I finished getting the loom warped and am already into my first piece, which is an organic cotton weft on the tencel/cotton warp. But it's a gorgeous fall day today, and I've been a bit scattered, and spending much of the day sitting in the intense sunlight finishing up another detective novel! 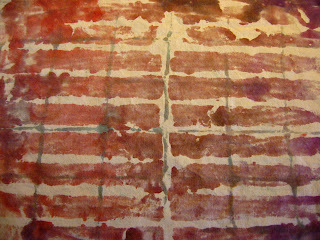 Today I arashi'd this silk chiffon scarf that I painted yesterday. I'm waiting for another painted scarf to dry, with its added metallic highlights, and then I'll be posting these handpainted beauties to Etsy as a new and growing collection. 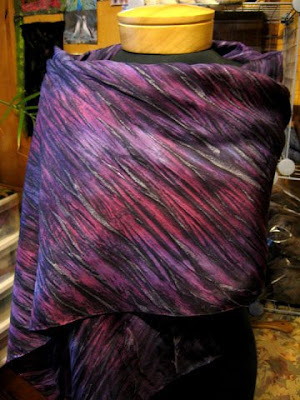 The scarf blanks are from China, 100 percent silk, handrolled hems, and a delight to work with. This one here is a 35" x 35" square. Mostly I'll be doing rectangles. 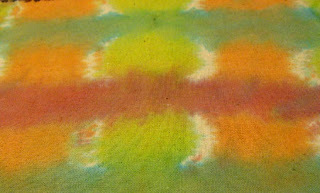 I dye painted a new crop of fabric pieces yesterday -- some turned out fantastic, some not as good. Now I'm tweaking my dyeing/printing accumen with regard to different fabrics and percentages of dyes so I have a bit more control over the results. I'm also warping my loom with 10 yards of cotton/tencel warp, for a batch of cellulose fiber fabrics for my growing stack of handwoven cloth. Back downstairs I go, to finish up. I spent a good deal of time this weekend considering lowering the prices on my handwoven scarves and shawls. And just did it. I love all the kudos I always get on my work, and I certainly don't value it any less now than I did when the prices were higher. But I came to the conclusion that I had priced myself right out of the market. And I really DO want to sell my work -- I don't want to merely say I sell it, put it out there for sale, but then not actually sell any of it! I've been having this "price/value" conversation for a long time -- years, actually -- but I'm tired of being at the forefront of the debate with no sales to show for it. The new prices still feel good to me as the artist, and the pieces should be of even higher value, now, to my buyers. And considering that most weavers who sell at Etsy are vastly underpricing their work, my work is still on the high end for that venue -- despite now being more than fifty percent less costly than they were! So go again to my Etsy shop and my website, and if you've lusted after any of my handwovens before but just couldn't consider buying them, perhaps now you can. And we'll all be happy! I have reupped my commitment to making art every day by joining Leah Piken Colidas (Creative Every Day) in her latest art challenge, Art Every Day Month. Check out Leah's blog and take on the art challenge. And remember: we're ALL artists, some of us just don't know it yet! Have fun, make art, inspire yourself and others! Finishing off these just-handwoven silk fabrics this afternoon, I had an epiphany of sorts, about what an awesome thing it is to weave plain fabric -- natural colored natural fiber yarns, simple plain weave, no frills...and I feel as though I've touched some ancestral vein in going back to basics. It's like tabula rasa, the blank canvas, beginning at the beginning. There's something so incredible about running a newly woven piece of plain fabric through my hands. I find it very fulfilling. All I want to do right now is weave plain fabric. Heavy "duke" silk weft on dupioni silk warp. I have about half a yard of this in length, 22" wide (they're all this width). Heavy "throwsters" silk weft on dupioni warp. Another half yard of this in length. Linen weft, dupioni warp. I have maybe 2/3 of a yard of this, ran out of warp or I definitely would have woven more. This piece is probably my favorite of the bunch. I thought the linen was silk, it was an old cone I picked up somewhere down the road, and it was shiny and soft on the outside. Once I started winding bobbins, the bast fiber quality of it showed up. This was my very first experience weaving linen, and I'll definitely be back to do more. 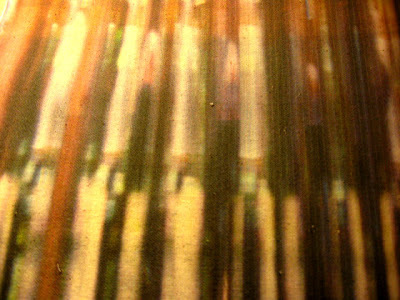 Dupioni weft on dupioni warp. That's right, handwoven 100% dupioni silk fabric! But this dupioni yarn is too heavy for my liking used like this. If I were going to weave dupioni on dupioni again, I'd prefer that it be a really fine dupioni, like maybe a 60s in weight, not this 10s. I've got a yard and a half of this piece. 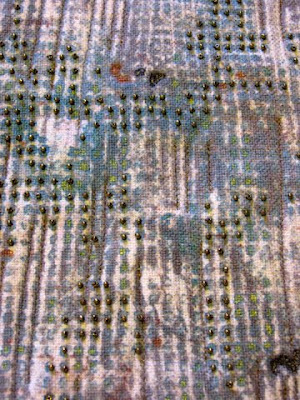 Silk noil weft on dupioni warp. I love this one. I really like silk fabric made with noil yarn, it has a grist to it and a lovely hand. Very organic in feel. I've got a yard and a half of this as well. 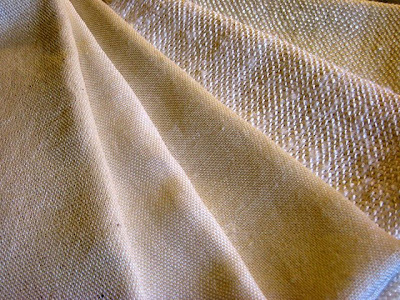 So on to the next batch of fabric, and coming up I'll be focusing on cellulose fibers primarily -- cotton, tencel, linen, rayon, and maybe a little silk thrown in for good measure. Friday afternoon, on my way down to Scotty's in Fortuna, I stopped by my new favorite haunt, a scrap metal boneyard, to prospect for cool rusted junk. This is some of the stuff I brought home. Until recently, I had completely forgotten how much I love picking through piles of old stuff looking for treasures. I love good old stuff, stuff that had a use in the past, stuff with history -- NOT the detritus of modern living, the crap you find at garage sales these days. The old stuff resonates with that part of me that would much rather fix something than replace it, if at all possible. Although this has become almost impossible these days, nearly everything being manufactured with planned obsolesence in mind. But I'm a tinkerer, and I love making things work again. I have a little lamp that I love that I've rewired probably half a dozen times. When I lived off the grid in Southern Humboldt, I was running that lamp on 12 volts, and the direct current fried the wiring about annually. I used to change the oil in my car, tune up my generator, service the deep cycle batteries that ran my 12-volt house system. It bothers me that so many things are made to be thrown away when they don't work anymore. Feels to me like a major metaphor for how we see old people in this country -- disposable once they've been dinged up a bit. Well, I'm getting on some kind of a political rant, so I'll end here! I overhauled my loom this morning. It's something I had intended to do soon anyway, because the shafts had begun sticking a bit and I needed to remove them and spray silicone in the races again. Thought I could put it off a bit longer, though. Then just this morning, weaving up the last few inches of the last piece on the dupioni silk warp, I knocked over my cup of hot mocha, which was up on the castle! OMG, what a mess! I daubed up what I could with a towel and sponge, finished off the piece, and cut the batch off the loom...then proceeded to tear the loom apart and clean every inch of it. This was probably the best cleaning it's had in the six years I've had the loom, so the task certainly wasn't for naught. Sometimes I wish I had a different loom -- I have a few minor complaints about my Schacht Mighty Wolf, often it seems as though others' looms are better or more professional than mine, I lust over what jacquard weavers are able to do with their looms. Just your basic, plain ol' loom envy. So it's a good exercise to get down and dirty with mine -- because it really is a lovely loom, a beautiful piece of equipment, it's light weight, easy to use, and can do what I need and want it to do. In the end, and putting aside all the bells and whistles that bigger/more shaft/jacquard/computerized looms have and what can be produced on them, in the end it is about the weaver, not the loom. It's what one does with the equipment, not the equipment itself. My Mighty Wolf is likely the only loom I'll ever own, so I'm committing myself to it, warts and all. It may not be perfect, but neither am I! Just a note that I'm having a sale on my hand spun/hand knit garments, at Etsy. From now until whenever, I'm giving 40 percent off the listed price of these items. Which is an incredible deal, considering how much time went into them, spinning and then knitting. Anyhow, see the group here. You can purchase through Etsy and I'll send you an invoice with the discounted price. 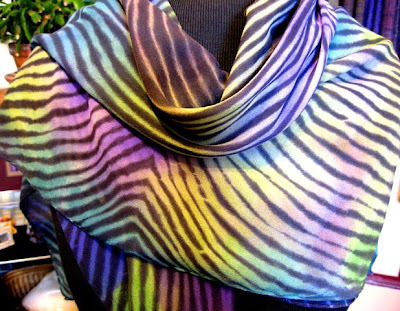 I just "remodeled" a scarf that I painted back in the early 1990s -- here's the original, at left. It's a habotai silk scarf, 14 x 72 inches. Yesterday I arashied the scarf, then added thinned metallic paint judiciously to the pleats before letting it dry following steaming. Much more dramatic, don't you think? 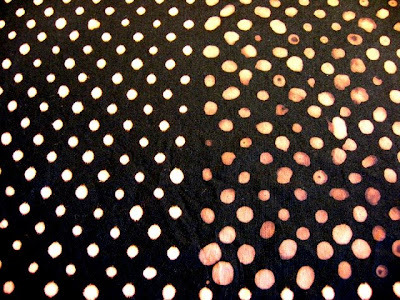 Finally, finally, I have tried some inkjet transfer right onto fabric. Here are two images, both texture photos that I took months ago and doctored in Photoshop. The first one is on raw silk, the second on natural cotton. Who knows what today will bring? I prepared a bunch of fabric yesterday for painting, so there'll likely be some of that. I'm quickly working through seven yards of dupioni silk warp, making several pieces of cloth with a variety of silk wefts. And the next weaving project is forming in my mind. Another article about me and my work today, on Bonnie Samuel's blog. Read it here. And thank you so much, Bonnie! A few days ago Etsy ran a story in it's Storque in-house newsletter, about seven high-end fiber artists with shops at Etsy, written by Bonnie Samuel of Bonnie Samuel Design. I am honored to be one of those seven artists...and you can read the article here. A couple of days later, Brit Marion Barnett of artmixter, another one of our illustrious seven, created a delightful Etsy Treasury featuring work from everyone in the group, including me. See the Treasury here. And if you'd like to check out the show at WomanMade Gallery in Chicago where one of my woven shiboris is on exhibit/for sale, you can do that here. My piece is image #21. There are two shows running concurrently at WomanMade, both parts of the Object of Desire exhibition -- one the Artisan Gallery of which I am a participant, the other a larger exhibit. Check them both out -- two galleries of awesome art by women! I just listed this little art quilt at my Etsy shop...last Friday it was one of my dye-painted fabric samples, today it's a finished piece! 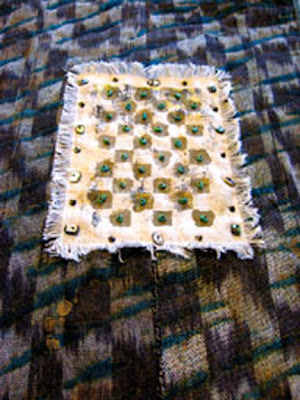 Called "Along These Lines," this little art quilt is made from a lovely piece of heavy weight, handwoven-like cotton fabric that was hand dyed and hand painted, machine quilted throughout the design, and embellished with hand sewn beads. It's backed and edged with homespun-type natural Osnaburg cotton fabric with hanging sleeve, finished size measuring 15 inches x 12.5 inches. There's something absolutely wonderful about finishing something, lock, stock and barrel. Makes me feel like I've really accomplished something! 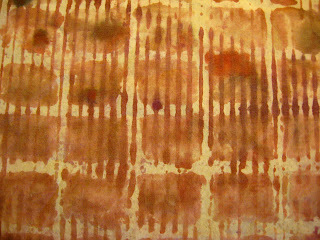 I've been following the Rust Dyeing group at Yahoo, and this week I produced my first rust dyed piece. The process itself really only takes over night or a full day at most, but I kept working on this same half yard of cotton fabric, trying different rusty things to see what gave the best images. The first two photos are the back and front of the cotton, and I used a rusty saw blade that I found in the shed behind my house. 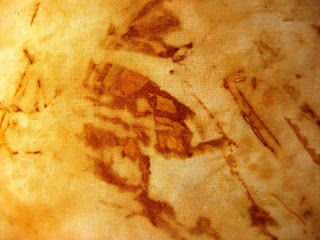 The second two images are close ups of places on the fabric where there were more distinct images. Rust dyeing is really simple: take a piece of fabric, any kind will do, and soak for a little while in vinegar water, 50/50 would be good. Directions I've seen say you should use salt water for cotton and vinegar for silk, but I found the salt water didn't work as well on cotton. I'll stick with vinegar in future, regardless of type of fabric. Then lay out the fabric on a piece of plastic, and place rusty junk wherever you want to, wrap the fabric around, wrap the plastic around the whole thing, and leave overnight or for a day. I worked this piece for five days, because I was trying different things, as I said above. I started with a beautiful piece of old rusty chain, pretty thick stuff, but found it didn't dye well because despite it's being so lovely, there wasn't much rusty surface area for the fabric to come in contact with. Then I tried a couple of rusty garden tools with long blades, which worked well. Then I found the saw blade and a fireplace tool set and tried all of those. Definitely flat stuff works best for covering larger areas with rust. This morning, satisfied that I had as much rust on the fabric as I wanted for now, I steamed it for 20 minutes, then washed and dried it. Now I've got a half yard of interesting dyed cotton to do something else with! Yesterday's malaise was followed by today's going for it, with experiments I'd been gearing up for since earlier in the week, if not longer. 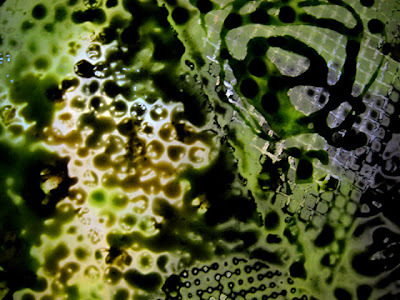 The main project was to print on a variety of fabrics, and mostly with the use of a gelatin plate. By the way, I need to stop a moment here and say that I've been very inspired recently by Rayna Gilman, her incredible work and her highly recommended book, "Create Your Own Handprinted Cloth." I love Rayna's spirit and energy, and her gorgeous quilts made with handprinted fabrics. 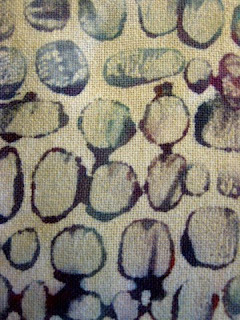 Anyhow, my work today was to print on cellulose and silk fabrics, which I'd prepared earlier in the week. I tore a bunch of sample sized pieces of different cottons and linen/rayon, and soaked them for about 10 minutes in hot soda ash water. Then air dried them. The silk fabrics, habotai and raw silk, were soaked for a few minutes in a 50% vinegar/water solution, then also air dried. 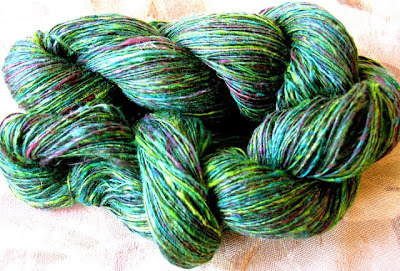 This was also my trial run with fiber reactive dyes. Although I decided this week to go with the Cibacron F dyes, from ProChem, while I'm awaiting delivery of those I used some Procion MX dyes I purchased a few years ago. First I made 1% stock solutions of the 4 primaries I have on hand, plus black. From the primaries, I mixed 5 colors I wanted to use. Then stirred in some sodium alginate this morning. I should note here that I decided a while ago that, exclusive of metallic paints, I was going to use thickened dyes instead of fabric paints. That's because I want to disturb the hand of the fabric as little as possible. Paints, which coat fibers, tend to stiffen fabrics. 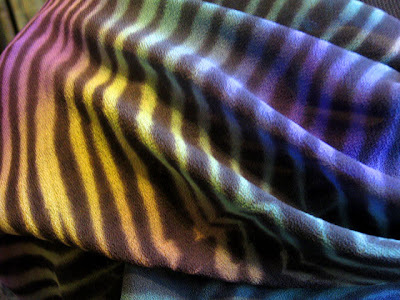 Whereas dyes, which penetrate the molecular structure of the fiber, leave the hand of the fabric as is. Another part of today's experiment was to set the colors with steam, instead of batching. "Batching" is the recommended way to set colors with fiber reactive dyes and what that amounts to is leaving the dyed or painted fabric to sit, covered with plastic, for 24-48 hours ideally at a room temperature of 70 degrees. Well, I'm not the kind of person who is willing to wait for a day or two to see the results of my work, and I don't have any place in my house with a constant ambient temperature of 70 degrees. Nor do I have the room to leave fabric stretched out and covered. Anyhow, today, after each sample piece was finished, I wrapped it up in plastic, put it in my steamer, and steamed the whole bunch for 30 minutes. I suspect the whole idea of batching might have come about because it seemed as though there might be an unusual amount of technology required to steam fabrics. 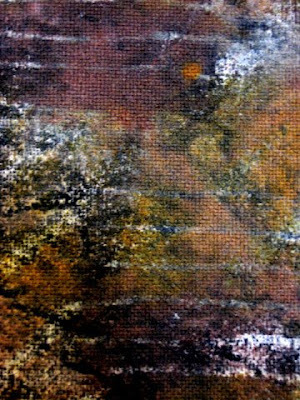 I know when I painted silk in the early 1990s, it did seem as though the only way to steam fabric was with one of those big and expensive horizontal or vertical steam things. 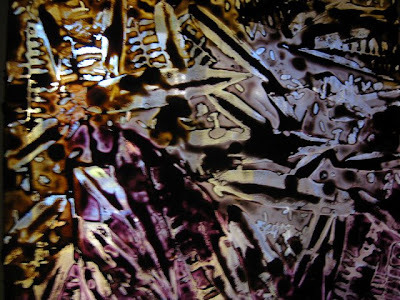 At that time I had neither the money nor the inclination to go that route, so instead I bought some liquid stuff from Jacquard to set the silk dyes I was using. It never occurred to me to simply wrap up the silk in plastic and stick it in the vegetable steamer -- which is precisely what I do today! Sample 1, above, is a piece of fairly heavy cotton, part of a tablecloth I bought at a rummage sale last weekend; printed with a rubber stamp I cut this week. 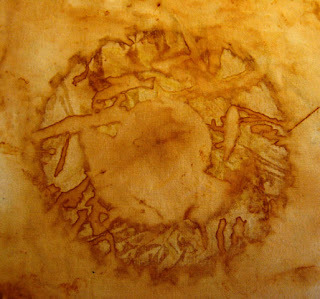 Sample 2, above, was an old pillow case, printed with construction fencing and corrugated cardboard on a gelatin plate. 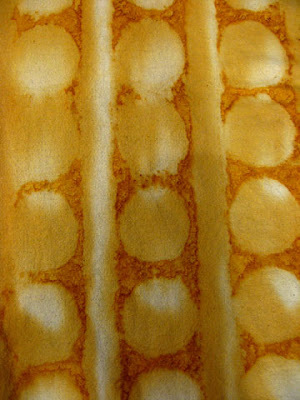 Sample 3, above, another piece of pillow case, printed with a cheap oven rack on a gelatin plate. 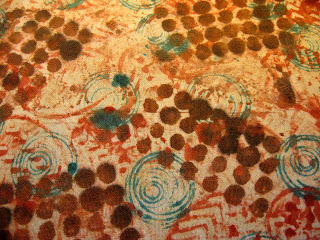 Sample 4, above, is a piece of habotai silk that I printed a few weeks ago with thickened acid dyes (the blue and green background), today overprinted with the procion dyes and an egg beater. Sample 5, above, is a piece of raw silk, printed with a foam grid thing on a gelatin plate. Sample 6, above, is a piece of that tablecloth cotton, printed with kitchen doodads and a stencil made from the side of a plastic box I bought at the Dollar Store (great place for cheap printing tools). 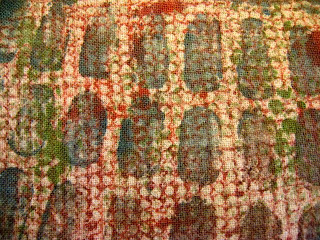 Sample 7, above, more of that heavy cotton printed with a couple of things on a gelatin plate. 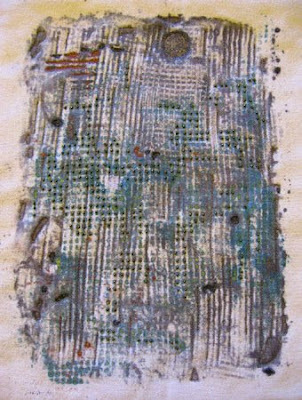 Sample 8, above, is a piece of linen/rayon printed on a gelatin plate, overprinted, and stenciled. So I had great fun today. I'm really glad to have finally broken the ice with fiber reactive dyes plus tried the steam-setting experiment I've been meaning to try for a while. I always enjoy opportunities to build my arsenal of skills and techniques for producing the results I want. Here's the skein of silk hankies I just finished spinning, from that really beautiful green/purple/turquoise stuff I dyed in my class a few weeks ago. I tried to make a thicker singles than usual, and I've got 500 yards. Think I'll knit up a little scarf. I haven't knit up any of the yarn from silk hankies before, and I know I'll enjoy it because I love all those textured bits of silk in the yarn. I'm just finishing up warping the loom with the dupioni silk, and have some other projects to get to this afternoon. But I'm also thinking of taking the afternoon off to pleasure read. This might be my internal response to feeling a lot of pressure recently. I'm thinking, why can't I do tomorrow what I had planned to do today? It won't really make any difference in the end. I've decided to take these three woven shibori pieces off-sale at Etsy, so I can "remodel" them with additional shibori and/or other surface designs. But before I do that, I am offering them at 25% off the listed price. This is a great opportunity to pick up one of my scarves if you've been considering the possibility. Go to my Etsy store to purchase, then wait for me to send you a discounted invoice through PayPal before paying. The scarf(s) will be shipped immediately. I had an interesting conversation with a weaving friend this afternoon, about teaching and intellectual property. 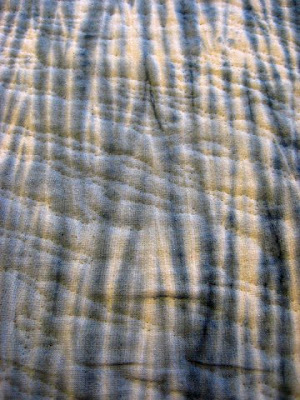 Quite specifically, my friend said she thinks I have little respect for intellectual property because I took a class from her a couple of years ago in which we did woven shibori, and now I make and sell woven shibori. 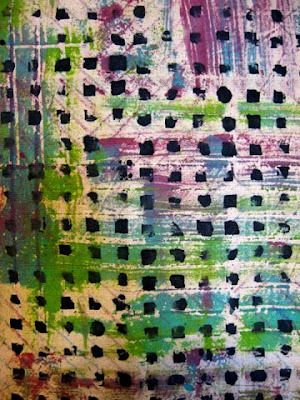 The fact is, I had Catherine Ellis' Woven Shibori book well before taking that class, and the class was merely a vehicle to jump start me into something I was going to do anyway. My friend did not teach me how to weave, the simple drafts we used, taken from Catherine's book, were simple weaving drafts in the public domain. This friend would doubtless have even greater difficulties with this issue were she to investigate all the open source information on the internet these days, plus the fact that folks like me post photos and explanations of how to do things, woven shibori and otherwise. I feel we're all learning from each other. I wonder whether Catherine Ellis would feel that my friend had no respect for intellectual property because she now teaches a process that Catherine developed! I try not to step on toes but I'm wondering how much this person might be feeling threatened by me. I did point out to her that while I am working at my art with the intention of selling it, her prerogative, in fact, is to be teaching the making of art. And that it might behoove her to loosen up her ideas of intellectual property, since in all likelihood some people are going to go forward with something they've "learned" from her. Teachers have to be willing to let go of thinking that they own what they teach, to avoid becoming parochial (limited or narrow in scope or outlook). I make this as a general statement, yet it aptly describes what I dislike about the local guild I am in the process of divorcing myself from. There's no sense here of fostering artistic growth. In my guild, it's more like, "I'm teaching you this and you'd better not aim to do more with it than become a hobbyist or a dabbler, someone who collects information and techniques but never pushes the envelope." In contrast, what I'm loving about blogging and having worldwide contacts of weavers and surface design artists, is that we're openly sharing information and ideas, inspiring each other, supporting each other, and reflecting objectivity and perspective. So anyway, my friend said now she has to find some other weaving thing to focus on, since this is a small community and there apparently isn't enough room for two woven shibori artists here. No matter our work is different, our aesthetic is different, our dyes are different, and our marketing focus is different. The thing is, I highly suspect there are other woven shibori weavers in this area...matter of fact, there are many more fiber artists in Humboldt County than the 50 or so who belong to the guild at any one time. None of the better ones belong to the guild, and for obvious reasons. Feels like excellent timing for me to be pulling out. Three finished pieces, off the loom yesterday, laundered and ready for whatever's next. Plus my growing short stack, below, of handwoven fabrics awaiting their respective fates. There are a few more hanging on the wall, as well. I've been in a place of flagging confidence recently, unsure of myself as an artist. I always feel like I'm just a beginner...there are so many artists so far ahead of me, whose work I so admire, that I feel I'll always be behind the curve. A wannabe. I am satisfied with the fabrics I'm weaving. And that's a good thing. But I'm overwhelmed with options and alternatives for turning said fabric into art cloth. I have to take it slower and I know it. Get good at one or two new techniques before moving on to others. But there's so much I want to try and everyday I wish I were doing more than I am doing, more than I obviously can do. Because I am doing what I can do already. I have such high expectations of myself. I always want myself to master things quickly. But reality, I suppose, is showing me that I need to take it at an assimilable pace and not get ahead of myself as much as I might want to. If I look back to where I was at the beginning of this year, or a year ago, I am in a very different place, much farther along artistically, I have a creative direction, I am capable of so much more, I have embraced so many new ideas and techniques. I tend to forget this on a day-to-day level. I wound a warp today and plan to be weaving my next set of pieces by end of this week. The warp is dupioni silk, beautiful shiny white stuff, and I'm planning several small pieces about a yard each in length. I have a bunch of unusual silk yarns to use for weft, some quite a bit heavier than I normally use. I've been wanting to weave them up into heftier silk fabrics. So that's what I'll be doing. It's interesting that I used to spend a lot of time spinning when I was thinking about things I wanted to weave, gearing up to weave, or avoiding weaving. Now I spend a lot of time weaving (or getting ready to) as I think about surface design things I want to do, gearing up for surface design, or avoiding surface design! I will be finished with the black undulating twill piece within the hour...just now taking a break. And to my delight, I was just notified that one of my handspun/handwoven pieces is listed in an Etsy Treasury, which you can see here. It's always an honor when another artist finds my work, given there are probably a couple hundred thousand of us on Etsy! Speaking of Etsy, if you haven't yet checked out my shop there, which includes several finished wearable art pieces, you can do that here. 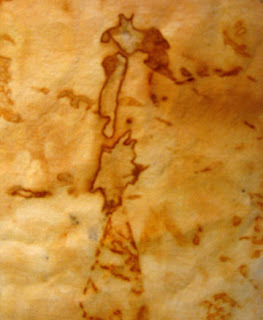 A fellow fiber artist and Etsian, Bonnie Samuel, told me recently about DaWanda, a European Etsy-type website. I'm considering becoming a member there so I have more access to the European art-buying market. It's on my list of stuff to research soon...well, I just now became a member, it's that easy to do. I'll work on getting my store up and running in the next week or so and will post a link when I have. Over the weekend I completed this little quilt piece. I like it a lot although I wouldn't go so far as to call it magnificent. But it's something that wanted to get made and it was important for me to take a project through to completion before moving on to the multitude of other projects in the queue. Blue Streak started out as a painted warp scarf that was handwoven of white commercial bombyx silk and black handspun tencel. Feeling it was a bit too drab, I painted it with metallic paint, then felt it needed more. I cut it in half and made a hanging piece, untied the fringe that had been on it, and experimented with numerous possibilities for overlays. Before putting anything on top, however, I wrapped the piece for arashi shibori and overdyed it turquoise, resulting in the blue streaks. Next I outlined all the turquoise areas with metallic ink. 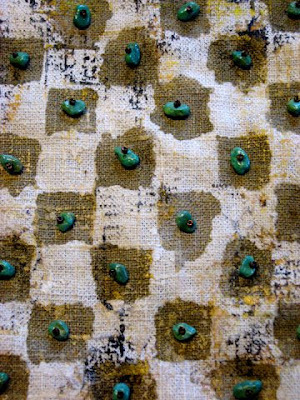 The piece I finally decided on to lay on top was a sample I stenciled with metallic paint on linen/rayon, after I unsuccessfully tried transferring a photo image on that sample. You can see what's left of the transfer in the background. Being the beader I am, I had to embellish the overlay with turquoise and abalone, my two favorite stones to work with. Then the piece wanted to be quilted, so I needed a backing fabric. In earlier posts I uploaded images of a couple of hand dyed fabric possibilities, and I finally decided on the first piece I dyed. I found some poly thread that perfectly matched the metallic gold ink, and I hand quilted the entire piece. 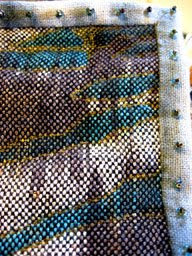 Yesterday I bound the edges, made up and sewed on a hanging sleeve, and beaded the edges. And there you have it. I've always said that if I were a carpenter, I'd be a finish carpenter. Because I love fine hand work. I also really like making quilts although I am not intending that the majority of my art cloth will end up as such. 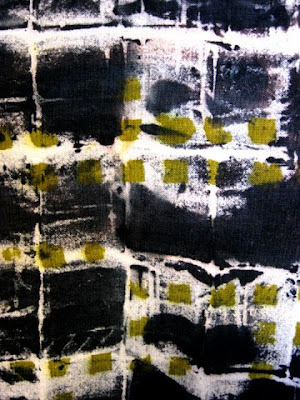 It is awfully compelling, though, seeing other artists' dye-paint-discharge work end up as little quilts. So who knows?! In other matters, the Surface Design Association is having their online auction, running through October 15, which you can check out here. Many member artists have donated fantastic work of all kinds to support SDA grants and scholarships. One of my pieces is available there...look for the piece entitled "Forest Night," and you might become the owner of it!